pSNAP-tag® (T7)-2 Vector is an Escherichia coli expression plasmid encoding the SNAP-tag protein. Expression is under control of the IPTG inducible T7 promoter. 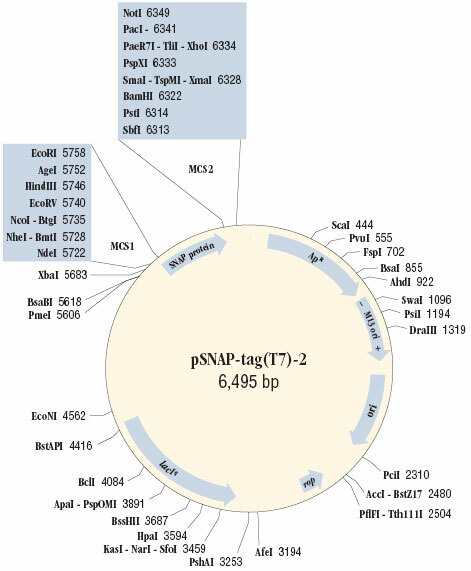 pSNAP-tag (T7)-2 Vector is an Escherichia coli expression plasmid encoding the SNAP-tag protein. Expression is under control of the IPTG inducible T7 promoter. The pSNAP-tag (T7)-2 Vector can also be used as a control plasmid expressing the SNAP-tag protein (20 kDa). The target gene should be cloned as a fusion to the N- or C-terminus of the SNAP-tag. The SNAP-tag is a novel tool for protein research, allowing the specific, covalent attachment of virtually any molecule to a protein of interest. The SNAP-tag is a protein based on human O6-alkylguanine-DNA-alkyltransferase (hAGT)(1,2,3). SNAP-tag substrates are derivatives of benzyl purines and benzyl chloropyrimidines. In the labeling reaction, the substituted benzyl group of the substrate is covalently attached to the SNAP-tag. There are two steps to using this system: sub cloning and expression of the protein of interest as a SNAP-tag fusion, and labeling of the fusion with the SNAP-tag substrate of choice. 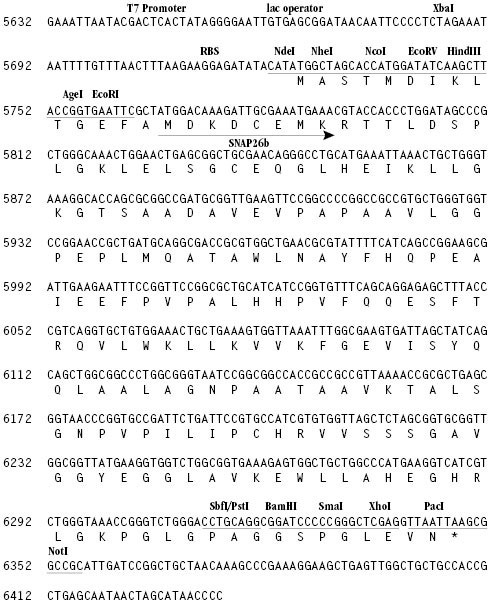 Cloning and expression of SNAP-tag fusion proteins are described in this document. The labeling of the fusion proteins with SNAP-tag substrates is described in the instructions supplied with SNAP-tag substrates. Unique restriction sites in the regions flanking the SNAP26b gene are displayed above the coding strand. This plasmid encodes the gene SNAP26b which is a mutant form of the human gene for O6-alkylguanine-DNA-alkyltransferase (hAGT). (Compared to wild type hAGT, the SNAP-tag protein contains the mutations C26A, K125A, A127T, R128A, G131K, G132T, M134L, R135S, C150S, N157G, S159E, and is truncated after G182). The codon usage of the gene is optimized for expression in E. coli. In the plasmid sequence, the SNAP26b gene is encoded from bp 5767 to 6311. It is not flanked by additional tags for purification. The plasmid contains the pMB1 origin of replication from pBR322 and is maintained at a similar copy number to pBR322 (at a moderate to low copy number of 20 copies/cell). It encodes an ampicillin resistance gene. This plasmid is intended as an expression vector for SNAP-tag gene fusions in appropriate E. coli strains. The strain needs to provide T7 polymerase in order to achieve expression from the T7 promoter upstream of the gene (4). Expression of the SNAP-tag in pSNAP-tag® (T7)-2 Vector has been tested in the following E. coli strains supplied by NEB: T7 Express Competent E. coli (NEB #C2566), T7 Express lq Competent E. coli (NEB #C3016), T7 Express lysY Competent E. coli (NEB #C3010) and T7 Express lysY/lq Competent E. coli (NEB #C3013). We recommend using T7 Express strains to conduct initial tests of the expression of the fusion gene. Storage: pSNAP-tag® (T7)-2 Vector is supplied in TE buffer (10 mM Tris-HCl, pH 8.0, 1 mM EDTA) at a concentration of 0.5 µg/µl. Plasmid solutions can be stored at 4°C for up to one week. For long-term storage -20°C is recommended. Keppler, A. et al. (2003). Nat. Biotechnol. 21, 86. Gautier, A. et al. (2008). Chem. Biol. 15, 128. Keppler, A. et al. (2004). Proc. Natl. Acad. Sci. USA. 101, 9955. Dubendorff, J.W. and Studier, F.W. (1991). J. Mol. Biol. 219, 45. Notice to Buyer/User: The Buyer/User has a non-exclusive license to use this system or any component thereof for RESEARCH AND DEVELOPMENT ONLY. Commercial use of this system or any components thereof requires a license from New England Biolabs, Inc., 240 County Road, Ipswich, MA 01938. For detailed information: see www.neb.com/cia/legal. NEW ENGLAND BIOLABS® and SNAP-TAG® are registered trademarks owned by New England Biolabs, Inc.